This splendid trek is a great combination of culture, demanding trekking with awesome astonishing views of Mount Kanchendzonga (8528m, 3rd highest mountain in the world), Mount Pandim, Kabru, Narsing that rise up from the dappled verdant silence of virgin woodlands of oak, walnut and with dense large Rhododendron forests (full in bloom in April/May). DZONGRI at 4000m. 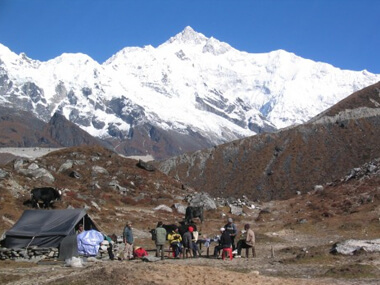 The Yuksom-Dzongri-Goechala trekking trial is the most beautiful trek in Sikkim , located in the National Park of Kanchendzonga. The route passes through almost entirely uninhabited and remarkable pristine forest past tiny yak herders summer settlements, remote monasteries up to an extensive alpine pasture of 4000m to Dzongri which has breath taking views of the Kanchendzonga mountain range and further trek goes up to 5000m at Goechala pass on the North East is the splendid pinnacle of Mount Pandim with its glaciers and ice falls. This region is considered the natural habit of the bharal (blue sheep) and the snow Leopard. Upon arrival at Bagdrogra Airport, we will bring you to Gangtok, traveling along the Teesta River up to the Himalayas passing smaller towns along the road. The journey takes App...5 hours. You will stay at Chumbi Hotel at Tibet road in Gangtok (in the heart of town). Dinner at the Hotel. You will Visit the World Famous Dharma Chakra centre- Rumtek, established by the 16th Gyalwa Karmapa (Tibetan Kagyu seat). Rumtek is located on a beautiful hilltop with view towards Gangtok. (1 hours drive) In the afternoon,you will spend time in Gangtok, Visit at Enchey Monastery, regarded as one of the most important monastery for people of Sikkim, the monastery is especially the worship place to the guardian Deities of Kanchendzonga and to receive consultation of Tibetan astrology. A glimpse of Sikkim`s most beautiful orchid can be found at flower show near by your hotel. After breakfast we transfer to Yuksom, this is where the first Dharma King or Monarch of Sikkim was coronated in 1641 by the 3 Tibetan Lamas. Yuksom is considered as one of the most sacred places in Sikkim , here you can find wish filling lakes, old monasteries and many stories of the mythology of the mighty Kanchendzonga. The journey to Yuksom takes about 5 hours and you will be traveling through a fantastic landscape with beautiful views, waterfalls and streams. We will stop for lunch at Rabangla- smaller town in South Sikkim . Arrival in afternoon in Yuksom. After breakfast we trek for app. 3 hours to Tshoka, the areas around feature a profusion of orchids growing in abundance. You can also have luck to encounter Red Panda (State animal of Sikkim ). Tshoka itself is the last village on this trekking route. The village have a Tibetan monastery and is the home of Bhutia/Tibetan farmers. We will spend the day, enjoy the beauty of village life, and get use to attitude. Overnight at Tourist Lodge (or inTent). Early morning (sunrise) walk up to Dzongri pass from where views of Kanchendzonga range looks ominously close. In front of you are the Kabru Dome, Frey Peak , Kokthang, Kabur, Rathong, Pandim, Talung, Kanchendzonga peaks standing aloof in all its celestial beauty. After break walk one day around Dzongri to different views ever closer to the peaks of Kanchendzonga. We will also get more balanced to the altitude height, we will relax and enjoy being in the Himalayas . Overnight at Dzongri. Mount Kanchendzonga- the guardian deity of Sikkim-being the third highest mountain in the world, soaring to the height of 28,168 feet. Kanchendzonga means the `five treasures of the great snows`, According to Sikkemese belief it is the repository of minerals, grains salt, weapons and Holy Scriptures. The trial again crosses high grasslands and the mountains closing in both sides as the valley narrows. We will trek to the last camp before Goechala pass which is the Zemthang base camp (4572m) next to the glacial lake Samiti . After lunch we will trek to Samiti Lake , another 3 -4 Hours. The area is astonishing beautiful, you are totally surrounded by mountain peaks. Over night halt in Tents. Early morning at 4 am we will start our trek to Goechala pass. A steep climb on a rocky landscape surrounded by the snowy peaks of Kanchendzonga. We will bring our head lamps which will give us light as well as from the stars in the night. We will arrive at Goechala pass to see the first sunlight hitting the Goechala Peak and other peaks of Kanchendzonga to enjoy this magnificent beautiful view ever mankind has put his eyes on. After breakfast 5 till 6 hours trek to Tsoka. The trail is gradually passing through a thick forest of large tree trunks of Rhododendrons. Over night in Tsoka. Trek the same way back to Yuksom via Bhakim, the walk is app. 12km and it will take us 5 hours. We will stop for lunch. And reach Yuksom in afternoon. Dinner at the hotel. A day to experience knowledge of Tibetan Buddhism, culture and the village life in Yuksom. After breakfast, we will walk to Dubdi monastery, located on a hilltop in Yuksom and visit the Norbugan (heritage site and coronation place of the first king in Sikkim ) Transfer from Yuksom to Pelling (2 hrs drive). Overnight stay at Mount Pandim Tourist lodge. Visit at Pemayagtse Monastery. (the perfect sublime lotus)which is perched o a wooden hilltop, and commands the most sublime view of the Khangchendzonga range. The monastery is built 1701. The main attraction of the monastery is the wooden replica of Zangdog Palri, the celestial abode of Guru Padmasambhava. The monastery has app.200 lamas, performing prayers and the rituals within the Nyingmapa order of Buddhism in Sikkim. After breakfast we will travel to Bagdroga Airport. app. 5hrs. We will say” Farewell and conclude”. You will have a connection flight to New Delhi and further to your international connection.